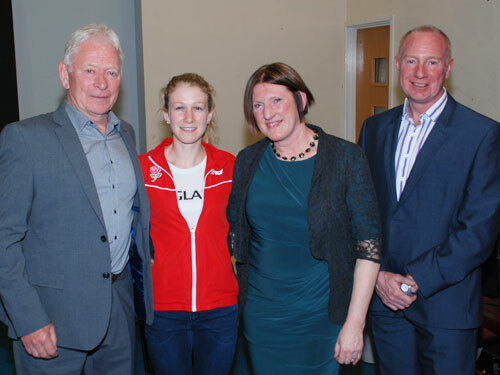 Olympic athletes attend Awards Evening. The club awards evening, to present awards for 2015, was held at the Silverwood Social Club on Saturday the 9th April, with around 200 attendees. As this year (2016) is an Olympic Year the club had invited 3 club athletes, who had been selected to represent GB at the Olympics, to attend as Guests of Honour. Alan Simpson (4th in the Tokyo Olympics 1500 metres final, 1964), Angela Creamer - now Green - (2 minutes 3.5 seconds in the 800 metres at the Montreal Olympics, 1976) and Peter Elliot (2nd to Peter Rono in the 1500 metres, and 4th in the 800m, at the Seoul Olympics in 1988); were joined by current England international Claire Duck from Leeds and helped present the awards to the worthy winners. The club awards recognise both athlete support for the club and performance, as well as volunteer contribution to the club. The athlete awards are given for Cross Country, Road, Track & Field & Local Events, and there are awards made to athletes who have achieved performances that place them in the Top 10, Top 30 and Top 100 national rankings. For the best Middle distance award (The Peter Elliott trophy), for the Most Improved Athlete (The Webster Cup) and for the best performance in a Track & Field championship (the Ralph Rowbotham trophy). Ralph Rowbotham award Leo Rowley.